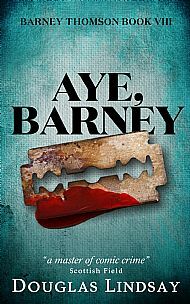 Today DouglasLindsay.com, in association with Almost Blood-Free Razors - For That 73% Safe Cut™, is proud to bring you an excerpt from the new, besteselling Barney Thomson novel, AYE BARNEY, the eighth book in the popular barbershop trilogy. Critics are already calling the book "a triumph of being able to put one word after another", and, "a book that adds nothing to the furtherment of human civilisation, but which might make you laugh once." Professor Malcolm Connery, of the Glasgow Institute of Special Things, called it, "the most staggering work of barbershop fiction this week." Click here to download the ebook, and here to order the paperback. Here's the excerpt. Film fans can note the two-word line borrowed from Robert Carlyle's portrayal of Barney in THE LEGEND OF BARNEY THOMSON. Barney swirled the cape around the neck of the customer as he took his seat, took a second or two to get a measure of what his hair needed – when he was in the zone, Barney didn’t have to ask, he just knew – and then took a razor and immediately started running it up the back of his neck. No how are you, no what d’you watch on TV last night, no if anyone else gets murdered around here they’re going to have to move Millport from its occasional Sunday evening two-hour drama slot, to a twenty-six week annual series on US television starring Mark Harmon. ‘Can’t stay, I’m afraid,’ said Barney, obviously directing the comment at Keanu, though he wasn’t looking at him. Barney smiled at the thought. Barney finished off the quick razoring of the sides of the hair, and then took about thirty seconds to blend in the razor line. ‘Awesome,’ said Keanu, although Igor muttered a ruefully disparaging arf from the back. Barney was already on to the top of the guy’s head, spraying a quick skoosh of water, then holding his hair straight, cutting quickly to finger length. Keanu evaluated old man Harris’s hair, then lifted the razor, debated which setting to put it on, and then began to slowly sculpt the back of his head. Barney zipped the scissors over his customer’s hair, ran a hand through it, then laid down his tools, lifted the hair dryer, wafted it sufficiently over his head to dry it off, then picked up the small clipper, buzzed it around his ear and neck, and then laid that down too, and whipped off the cape. ‘You’re done. You can pay Igor, please. Next,’ he added, turning to the queue. The guy studied his hair in the mirror. ‘What do they charge?’ asked Barney. He pronounced herbal the American way, with a silent h.
Barney jerked at the door with his thumb, then turned to the queue. The next in line, happy to be whipped into shape, jumped out of his seat and sat down in the newly-vacated barber’s chair without taking off his jacket. ‘Shadow recruit,’ said Keanu, looking at Barney and smiling. Barney smiled kindly and raised his eyes a little. Comment from Billie at 14:43 on 22 September 2018. Yes!!!! Oh how I've missed you Barney! Comment from Marilyn at 17:54 on 22 September 2018. I don't even like Barney that much, but you are an irresistible writer. Some just are...and you are...as this little excerpt shows. No waste, perfectly worded, humorous, not a foot wrong, as they say. Mindful of that American, Donald Westlake. I do like your other works and have read you since your days with Al Guthrie, from whom I learned of you. Comment from Markus at 20:09 on 01 November 2018. YEAH! Instant order. I thought there wouldn't be any new Barney's so the surprise was even greater when this one just popped up out of nowhere. Thank you very much!